Pati Shaptar Pithe/Pitha or coconut filled rice crepes. Pati means a mat, and shapta means simple in Bengali. 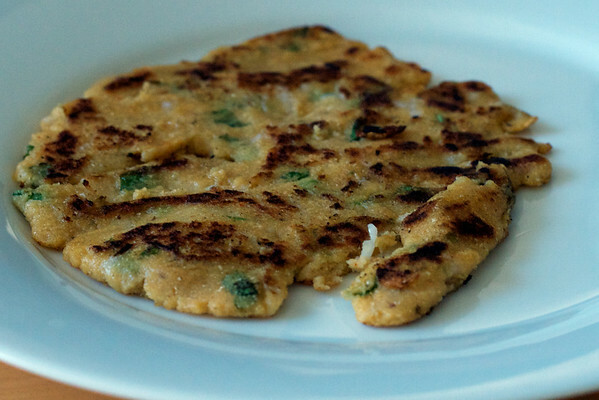 Grate raw coconut (or get frozen unsweetened grated coconut and thaw), about two cups, add sugar to taste and stir fry until golden brown. If you wish, you can add a tablespoon of raisins and a tablespoon of toasted and chopped cashew nuts or slivered almonds. 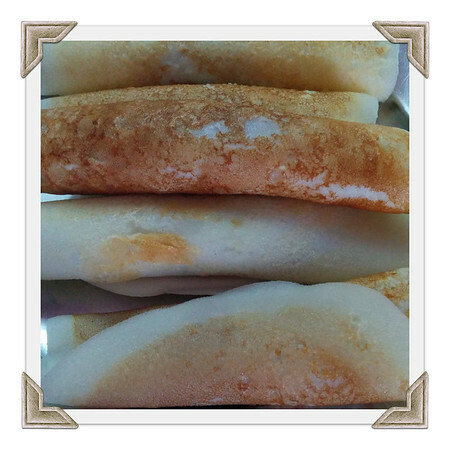 Pitha comes in various shapes. These are the simplest. 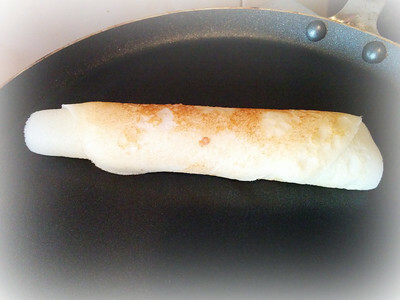 To prepare the crepe batter, to a cup of rice flour, add a pinch of salt, and a tablespoon of sugar. Add milk, 2% or full fat preferably, until the batter consistency is like crepe. Heat up a non-stick pan. If needed, you can wipe it down with a buttered cloth/brush. Follow cooking temperature regimen for a crepe. 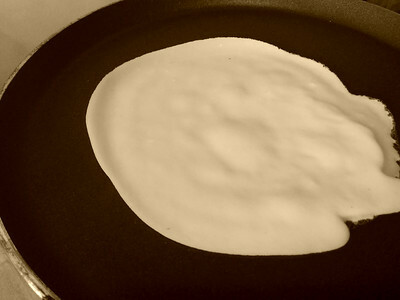 Pour about 1/4 cup of batter and roll it around on the hot pan to form a thin crepe. 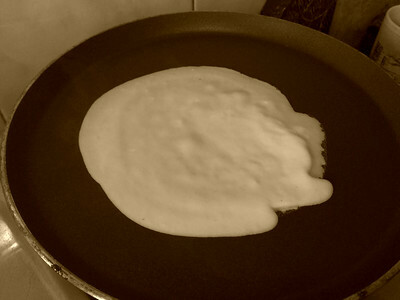 As the crepe cooks, it starts to lift off the edges. Add two tablespoons of filling. Optionally, form the filling in the palm of your hand in shape of a small spheroid. Roll in form of a fat cigar. Keep aside while you prepare the rest. 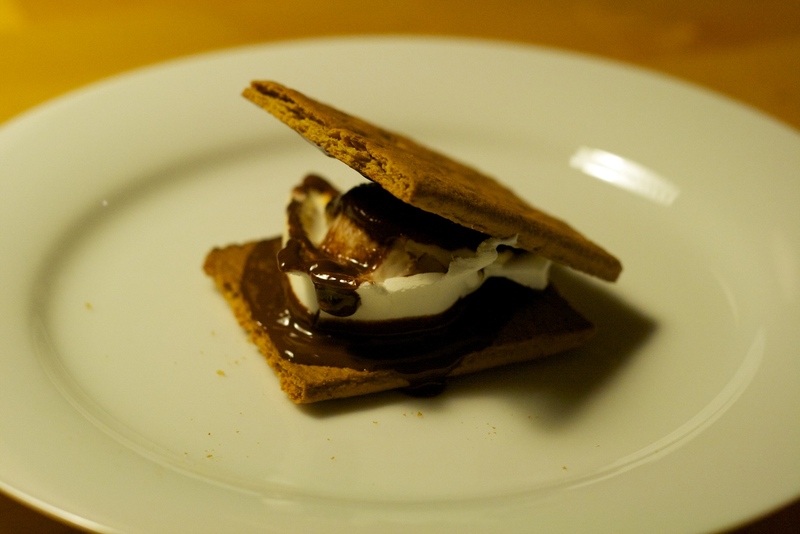 These can be eaten warm or at room temperature. To take them to the next level (i.e. not simple), you can bake them in condensed milk as well but they do become heavy. Drizzling some condensed milk on top while not traditional can be an excellent substitute. During this trip to India, I am seeing some new sweets in Bengal including baked rasogolla (boiled cheese balls dunked in sugar syrup) , Kolkata’s famous sweet and chana pora (literal translation for roasted cheese), a dish very similar to cheese cake. You have surely heard stories of chefs stirring sauces with their hands. My story involves my mother-in-law shaping old-fashioned corn rotis on the hot griddle with her hands. I am presenting a story here and not a recipe. 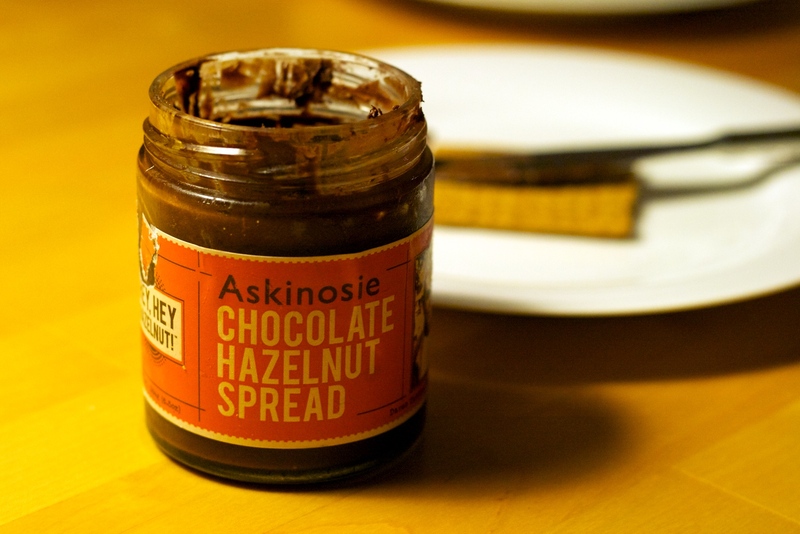 I can’t follow this recipe and I won’t recommend you try. She estimates amount of corn flour she will need based on how hungry the family is. 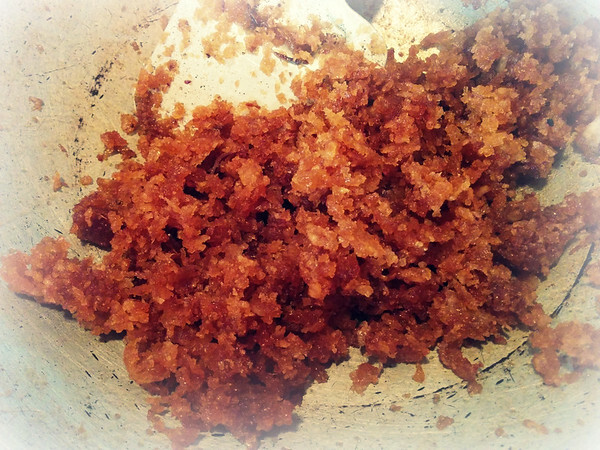 Adds appropriate amount of grated radish, chopped radish leaves, salt, dry mango powder, hot paprika and water. 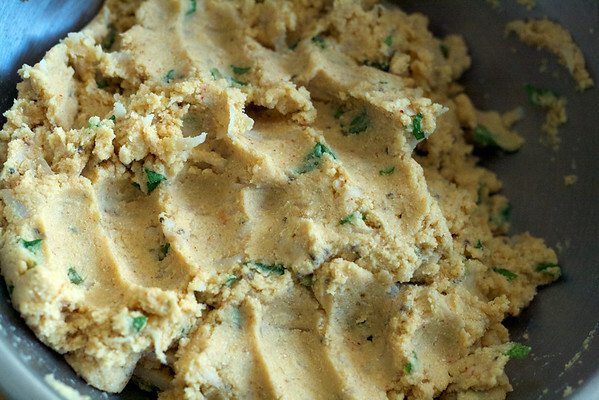 Kneads to form a pliable dough. She puts the griddle to heat on medium-high, and keeps following things handy - a bowl of water convenient to dip her fingers in, a tablespoon and a cup of vegetable oil. 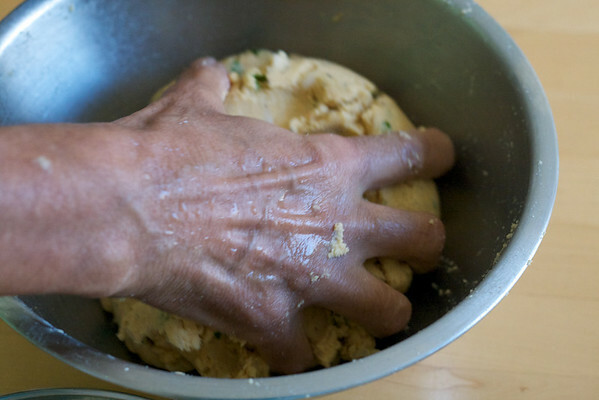 She shapes tennis ball sized dough in her hands and flattens each into a fat roti with her palms. She oils the pan lightly, places the roti on the hot griddle, dips her hand in cold water and flattens the fat roti into a thinner one. 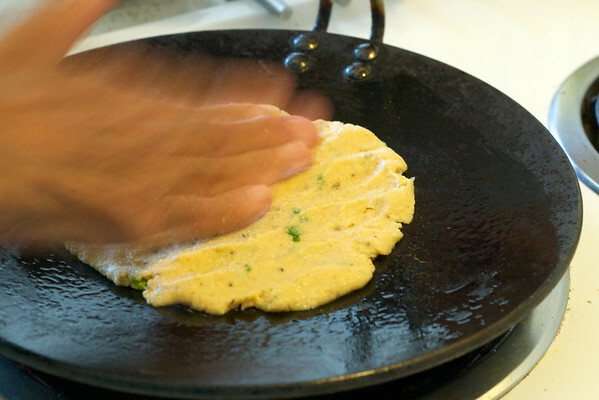 Then she ladles oil along the edges so the oil slides underneath and cooks the underside of the roti. 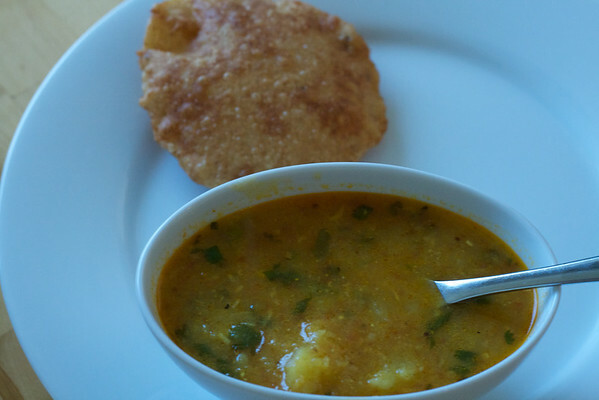 These rotis take a few minutes per side to cook. She flips only when the underside is done and repeats the oil treatment. 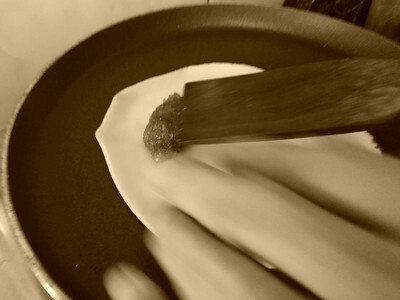 The flipping is done gently as the corn rotis break relatively easily due to lack of gluten. Voila! They are ready to serve. 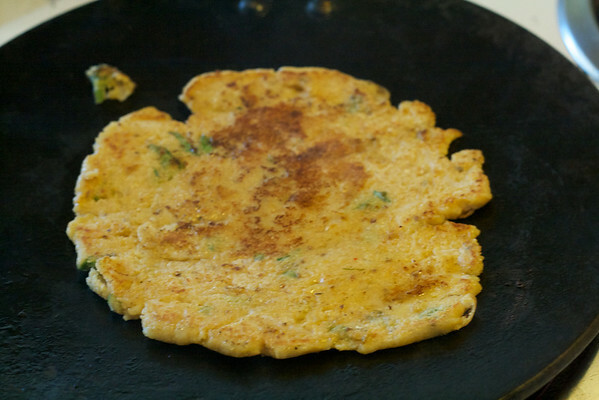 The rotis are crisp on the outside, melt-y polenta-like inside. 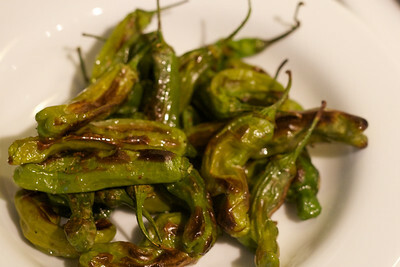 Traditionally served with mustard greens that has been cooked for hours into a buttery smooth piquant sauce.